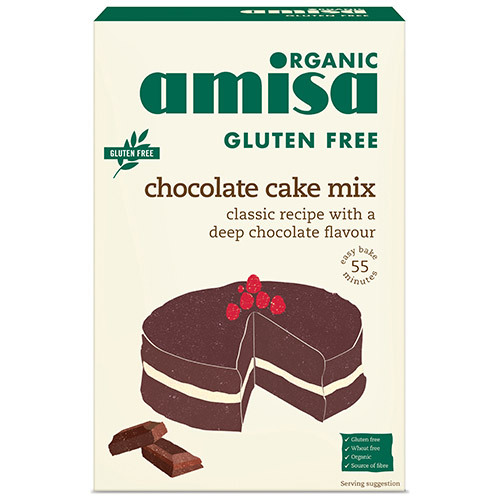 Amisa Organic Chocolate Cake Mix is a rich, deep chocolate flavoured cake mix. Chocoholics will not be disappointed with this classic recipe. Raw cane sugar*, corn flour*, dark chocolate leaves* (12.5%) (raw cane sugar*, cocoa mass*, cocoa butter*, emulsifying agent: sunflower lecithin), wholegrain rice flour*, cocoa powder* (7.5%), baking powder (raising agent: sodium bicarbonate, acidification agent: cream of tartar, corn starch*), thickener: carob bean gum*, sea salt, bourbon vanilla*. Preheat oven to 175°C. Mix contents with 110g of soft butter or margarine, 3 eggs and 100ml milk and stir until smooth. Pour the mixture into a loaf tin (10x25cm or 20cm diameter) and bake for 55 minutes. 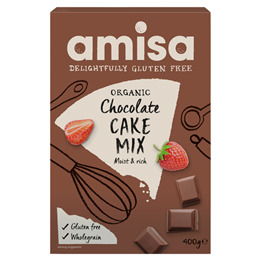 Below are reviews of Amisa Organic Chocolate Cake Mix - 400g - Best before date is 30th June 2019 by bodykind customers. If you have tried this product we'd love to hear what you think so please leave a review.